Down in South Florida, pool fencing is a must have when you have young kids running around or babies on the way. Kids get curious and will want to get close to the pool. With a pool fence installed by Fence Builders Pembroke Pines you will never need to worry about that again. We custom fit all of our pool fencing solutions to the needs of each backyard. We ensure that there are no possible opening so no mistakes can happen ! Pembroke Pines, FL offers a taste of paradise to all of its residents and visitors, year round. Being so close to Florida’s east coast, beach life is plentiful in this beautiful city. However, sometimes the beach is too crowded, so you have a pool! Pools are great for entertaining both your guests and family, but also a great way to cool down throughout the year. Pools need protection, just like your yard, and Fence Builders Pembroke Pines has the perfect pool fence for your residential property or commercial property. Fence Builders Pembroke Pines offers professional pool fence installation services to help keep your pool secured. Perhaps you need a sturdy iron fence around your pool. Our iron pool fences are built for security, and not so much for privacy. 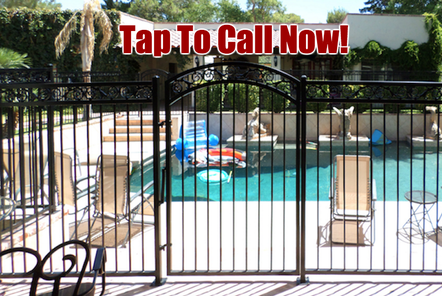 These iron pool fences are also built to make sure no one can climb in, or climb out, of your fully secured pool. Fence Builders Pembroke Pines offers a variety of fencing materials for your pool fence so that your pool fence will compliment your home and yard. From chain link to iron, we try not to put any limitations on your pool fence design. In Pembroke Pines, FL, you see a lot of pools that are protected by pool cages. A giant pool cage for your hotel or apartment pool may not be financially available to you. Fence Builders Pembroke Pines offers pool fences for commercial properties that are much more economical than an expensive pool cage. Take for example your apartment complex pool. This pool entertains all of your tenants, including children. You want to make sure all of your tenants are secure while using your apartment pool, and a pool fence is a great option for that! Fence Builders Pembroke Pines will professionally install a pool fence around your commercial pool. If you need a tall, sturdy iron fence, we can install that pool fence. If you want to keep the pool private, we offer privacy pool fences as well. Our pool fences are also available in a variety of styles to help compliment your commercial pool property. At Fence Builders Pembroke Pines, we professionally install all of our fences, including pool fences. Each pool fence is built up to code, and we obtain all of the proper permits. Fence Builders Pembroke Pines pays much attention to how we install pool fences, because a pool fence should offer optimum security. Using a pool fence to enhance the security of your pool is a great way to ensure you, your family, and your guests are completely protected while using the pool. Fence Builders Pembroke Pines will also install a gate for your pool fence. This allows access to and from your pool. When it comes to your commercial pool or residential pool, you do not want to take any chances with security and protection. Fence Builders Pembroke Pines will ensure that your pool fence is properly installed so that you can rest easy knowing that your guests are that much more protected.